When we discussed the archiefbank from the Amsterdam city archive I promised we would look at their image database in a separate post. So, today we will take a look at the beeldbank (image database) of the Amsterdam city archive. Images. The database contains currently 237,298 images, most of them of Amsterdam: 180,000 photos, 12,000 prints, almost 11,000 drawings, 30,000 designs of buildings, and a few other objects. The online collection is growing all the time, so by the time you read this the numbers may already be higher. No, the interface is only available in Dutch. Fill in your search phrase in the search box on the top, and optionally a period (the fields van jaar, from year, and tot jaar, until year, will become visible when you start typing in the search box) and press the red zoek button. To refine your search, check zoek in resultaat (search within result) before entering another search phrase. 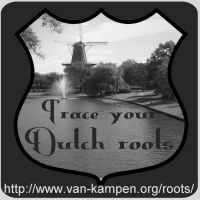 Check nieuwe zoekopdracht (new search) again to start a new search. Click on an image in the search results to enlarge.In the larger image there are buttons to the left of the picture to zoom in and out. Click the cross (on the right of the red bar above the image) to close the image and go back to the search results. Browsing the collection is free, but there are charges for downloading (currently €16.30 per image), ordering prints, and publication (€75 for publication on a website). See the price list for details. New images are added all the time. If your ancestors were from Amsterdam, or if you want to see what the Dutch capital looked like in the past, the beeldbank is a site you should visit. Where most image databases offer the option to download low resolution scans for personal use for free, this beeldbank charges a hefty €16.30 per image (for high resolution scans). Free download of low-res scans would be a great enhancement. Another welcome addition would be an English interface.